2017 has proven to be a very good year for PACE of the Triad, a local non-profit health and human services agency serving Guilford and Rockingham counties. 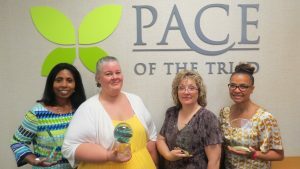 The organization is celebrating multiple state-wide recognitions received by four PACE of the Triad employees. NC PACE Association presented awards to Nedra Baldwin and Adria Smith at the NC PACE conference in Durham. NC PACE Association is a member organization that supports the development, expansion, success and quality of PACE programs throughout North Carolina. As Director of Community Engagement for PACE of the Triad, Baldwin serves on the leadership team and is responsible for outreach, marketing and development. She received the NC PACE Award of Merit for Non-Direct Care and was recognized for upholding the vision and dedication of the PACE team. Smith is the Quality Assurance & Performance Improvement Coordinator and is also a member of the PACE of the Triad leadership team. She received the Dr. Marsha Fretwell NC PACEsetter award for the extraordinary impact she made through her work with PACE programs locally, regionally and nationally. LeadingAge NC recently recognized two PACE of the Triad employees, Lucillia Davis-Durning and Janet Pennell, LCSW. LeadingAge NC is a state aging services member organization that provides advocacy, education and research support. The awards were presented at LeadingAge NC’s annual meeting in Pinehurst. Lucillia Davis-Durning serves as Human Resources coordinator at PACE of the Triad. Davis-Durning received the LeadingAge NC Emerging Leader award for demonstrating aptitude for and commitment to professional growth as a leader who has assumed expanded leadership responsibilities. PACE of the Triad Social Worker, Janet Pennell, MSW, LCSW received the Service Excellence award for extraordinary talent, expertise and dedication in provision of exceptional service.